". . . The real story of my race really wasn't me . . . Chapter 5 would be about my competitors. for anything we accomplish. Without their challenge we cannot reach our potential. gotten three laps up and was pretty sure she couldn't catch me . . . if I kept moving." And I didn't catch him! I didn't even try. I was toast when I quit after 35 miles -- which was about double what I was actually trained to do -- and had no desire to go back out for more laps after I got up with two hours to go. But it would have been fun if I'd been able to rise to Laz's challenge! Laz taught both Jim and me something important this weekend, but it may not be what he thinks. It's so simple that we both had the same, "Well, duh!!" reaction when he said it. And it made both of us get back out on the course to rack up more miles than some of our competitors. I have ambivalent thoughts about even revealing it here because it will make it that much harder for us to place higher in future events! But I want to give Laz credit for the brilliant revelation. Here's how it went down . . . I was quite happy when I finished the lap that put me over the 50K mark. Although I was well-trained and able to run and walk 82 miles in 24 hours at ATY (Across the Years) in December, I was not at all distance, flat-terrain, heat, or humidity trained for this race and didn't even have it on my agenda until a couple of weeks ago. An experienced ultra runner, the 50K mark was honestly an optimistic, overly-ambitious goal for me this time. But since I love being out on the Hinson Lake course at night, I told my lap counter that I was taking a break, not that I was stopping for good. I really wanted to go out for a few more laps that night, even if they hurt, and Laz provided the motivation. I was sitting next to the course around 9PM, enjoying some hot soup and perfectly contented with the miles I'd already completed, when Laz walked by. He commented that he had reached the 50K mark and was going to go out for "one more" lap so he'd have more distance than all the other runners who chose to stop at 50K. Well, darn!! How come Jim and I have never thought about that simple concept since we began doing fixed-time races a couple years ago???!!! And that's exactly why I went out for TWO more loops -- not to beat Laz particularly, but anyone else who used his rationale of ONE more. After those two laps I did quit. I had more than exceeded my expectations for the weekend and didn't want to pay the piper later. That's why Laz's goading at sunrise didn't motivate me to get back out there a second time, much as my ego wanted to. 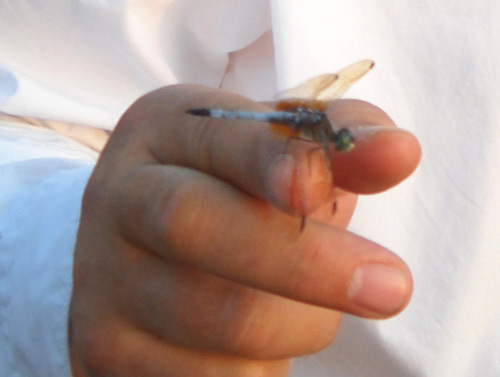 Gary (L) inspects a dragon-fly that landed on his hand near the end of the race. It probably likes his salty sweat; a butterfly did that once to me. His concept of continuing on just past the 50K or other common distance in a fixed-time race also ties in with another important "ah-ha" Laz-ism that he outlined in his UltraRunning article several issues ago about "quit points." I've always known that there are spots in races where runners tend to drop out -- think Bill's Barn at VT100, Foresthill School at Western States, Brighton Ski Lodge at Wasatch, or the start/finish area of any multi-loop course of any distance. These are common points where you really have to be motivated and focused to keep going because they are so doggone convenient to drop out when you're pooped. I never had such a good term for the concept before seeing it in Laz's essay, however. 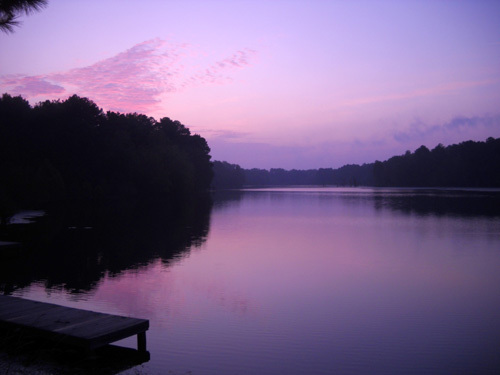 In fixed-time races like Hinson Lake, not only do runners go by their vehicle and/or personal crewing station every 1� miles, they may also reach common goal distances like the marathon, 50K, 50-mile, 100K, and 100-mile marks. Now I realize that these can also be considered "quit points." I bet many runners could probably go just a little farther and not only challenge themselves a bit more but also rack up more miles than t he folks who stopped at the common goal marks, thereby finishing higher in the standings. Thank you for the lessons, Laz! And thank you for all the wisdom and humor you've dispensed to all of us on the ultra list and in person over the years. WHO IS THIS LAZ FELLA? "Gary Cantrell is a sadist and these runners are masochists." That anonymous comment about a Washington Post article on the Barkley Marathons is pretty accurate. But he's a nice sadist! Let me explain . . .
One of the best-known "characters" in the world of ultra running is Gary Cantrell, who goes by the pseudonym of "lazarus lake" when the fancy strikes him. He knows his grammar, spelling, and punctuation just fine but he's one of those hip folks who use lower case letters and minimal punctuation in e-mails. My brain can read posts like his, my fingers just can't type like that (!) -- hence, my modification to his ultra list post at the top of this page. Gary is a veteran ultra runner who has been writing articles about the sport for various running publications since the 1980s or earlier, well before I ventured into the world of ultra running in 1992. His monthly articles in UltraRunning magazine and his frequent, informal posts to the internet ultra list are some of the most pragmatic yet insightful and humorous slices of life that you ever could read. He suffers no fools but does so with a dry wit and diplomacy. The man truly has a way with words. He is one of the very few people on the ultra list whose posts Jim will read every time they grace our computer monitors. In addition to all that, Gary has been an ultra marathon race director for many years. 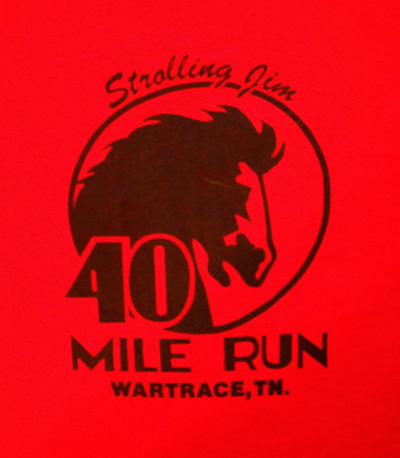 One of my first ultras was Gary's classic Strolling Jim 41.2- mile road race that began and ended in little Wartrace, TN. I ran this very hilly, mostly paved race in 1993 when I was much faster than I am now. I still have the bright red finisher's shirt that indicates I ran the race in under 7 hours; each finish hour is a different color. My 9:25/mile pace at Strolling Jim (a 6:28:16 hour total time) makes me as proud as my 10:06 pace/mile pace (total time of 8:20:58 hours) for 50 miles at LeGrizz later that year. Those are two of my best ultra performances. This past May was the 31st edition of the Strolling Jim. Even though one of Gary's daughters is the RD now, I still consider it "his" race. It's a classic. There aren't many other ultras that have been around that long. The only time I ever ran The Jim was in 1993. That was also the only time I've ever seen Gary, sixteen long years ago. I still remember the unique figure he cut in his signature white dress shirt, long trench coat, and cowboy hat, chain smoking cigarettes before and after the race. How many ultra runners do you know that smoke?? Gary still smokes and has no intentions of giving up that habit (his rationale is interesting, as you'd expect). Jim has never run Stolling Jim OR met Gary until this past Saturday. Yet because of Gary's prolific writings and some back-channel correspondence I've had with him over the years, we both felt like we knew him as a friend. The second long-standing race for which Gary is renowned is the Last Annual Vol-State Road Race, a 314-mile run across the state of Tennessee (the Volunteer State) from Durena Landing, Missouri, to Castle Rock, Georgia. Gary directed the 29th "last annual" version of the race this past July, in the middle of the summer heat. Competitors have ten days in which to complete the race. This year eighteen runners began the grueling multi-day event and most of them finished. Did I mention that there are no aid stations along the way? Runners are self-supported and/or crewed, supplying themselves and finding their own overnight accommodations along the way. Even more of a challenge is the highway traffic . . .
Ready to sign up for that one yet? Gary is also the creative (some would say diabolical) mind behind the popular Barkley Marathons, a nearly impossible-to-finish 100-mile footrace at Frozen Head State Park in eastern Tennessee. Held in early April when the unpredictable weather in those mountains can range from sleet and snow and howling winds to unseasonable heat, high humidity, and deluges of rain, the unmarked course follows briar-infested "trails" up and down extremely steep grades, over and under deadfall, across sometimes-raging streams, and close enough to the Brushy Mountain State Prison that participants have good reason not to wander too far off course. The first four loops alternate direction, making the course even more difficult than it already is to follow. The few who make it to the fifth loop have the dubious choice of which direction to take that time. Gary also has a tendency to modify the course each year so repeat offenders don't get too familiar with it. As if. The time limit is 60 hours, which is nowhere near as generous as it sounds. The elevation gain and loss is unbelievable for a state east of the Rockies. Runners (hikers!) have to find ten different books that are hidden along the course and tear out the page from each that corresponds to their race number (don't know how that works on subsequent loops) to prove they completed each 20-mile loop. The book titles ironically relate somehow to the race, of course. That's part of Gary's wicked humor. Runners are chosen for Barkley by reputation or by how creative their entry essays are written. The entry fee is $1.55 and a license plate from their home state. Gary has quite a collection of license plates by now, which he displays at the start/finish area of the race, although only 30-40 runners are allowed into the race each year. There are other quirks and traditions in this race, such as not knowing exactly what time it will start (when Gary lights his cigarette) and the bugle playing "Taps" as each runner quits the race. Oh, and the name of the race? Barkley is the guy who originally provided Gary with the raw chicken he still offers up at the event (raw, not cooked, they say). I'm not sure if there's much of an aid station at this race either. Many runners who have finished difficult mountain 100-milers and multi-day races are proud of themselves if they can finish Barkley's "Fun Run" (three loops, or 60 miles, of the course). Even 20 miles is deemed a "success" by a lot of experienced ultra runners who attempt the race. Despite the low odds of finishing more than 20 miles of the course, runners clamor to get in so they can see what all the fuss is about. Not us! Neither Jim nor I have ever been even remotely interested in "running" Barkley but it's fun to read runners' reports after the race each year. One of the more memorable incidents was our friend Dan Baglione's attempt a few years ago in which he progressed about two miles in 32 hours, or something like that. He was hopelessly lost but jokes about it to this day; just attempting the race is like a badge of honor for many of the participants. By the way, Dan was already well into his 70s at the time. He's been one of our ultra inspirations since we met him many years ago. After Jim and I had set up our personal aid station in the parking area in front of the lodge at Hinson Lake on Saturday morning, I looked around to see who had come in while we were focused on our task. Lo and behold, about 50 feet away sat Gary Cantrell AKA "Laz" next to the vehicle he rode to the race with his friend, Steve Durban. He looked calm and collected, wisely conserving his energy before the race began. Several people went over to talk to him. I was a little hesitant at first, not quite knowing what to say and wondering if he'd even remember my name. Not only did he remember my name, he knew who I was before I even ventured over to say hi. He's a keen observer. So much for being intimidated by an ultra icon. We talked for a few minutes, then I introduced both Jim and Joe Lugiano to him. 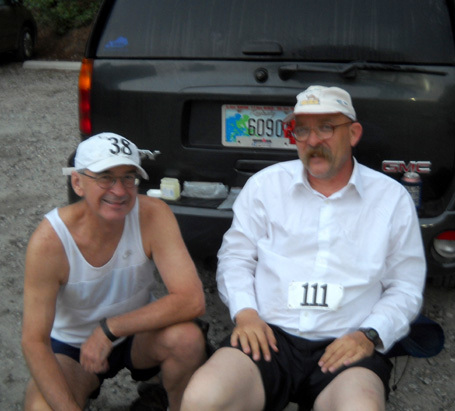 Joe and Gary had corresponded by e-mail before, but had never met even though both have been running and directing ultras for many years (Joe is currently co-RD of the Umstead 100). 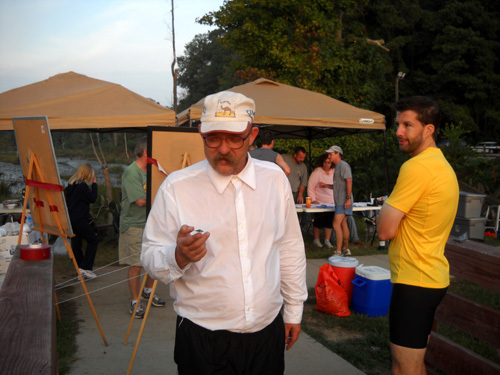 Lots of runners took the opportunity to meet the infamous "Laz" at Hinson Lake, which was wise because he doesn't show up at many races any more. I enjoyed seeing Gary out on the course during the day and evening Saturday. Although he was going slower than most of the other participants he was steady and racked up 41 miles, farther than he thought he'd be able to go with the reduced training he's been able to do in recent years. I walked with him a couple of times on the course, traded encouragement with him when we were both at our vehicles about the same time, and listened with interest at night when he came over to talk to me for a while. We talked about his farm, family, job, and high school coaching, our running, the various physical problems that challenge us both, and other topics. It was a pleasure to be able to spend so much time with him, although I had to excuse myself to get some sleep. I was one tired puppy by about 2AM. I was hoping to get a picture of Ray K and Doyle Carpenter with Gary but I never saw the three "legends" together when I had my camera with me. What a treasure trove they are! The people -- that's why I love this sport so much.